San Francisco (Obama.net)- At a time when the Midterm Election is less than a month away and most would expect President Barack Obama to be working day and night to make sure that the Democratic Party maintains the majority in both the House of Representatives and the Senate so that he can get his initiatives passed with greater ease, the President of the United States is not forgetting other important issues. The BP oil spill in the Gulf of Mexico may not be headline news anymore and many may even be considering it yesterday’s news already, but President Obama is still working hard to make sure that the regions affected by the disaster get the help and support that they need in the ever important recovery effort. 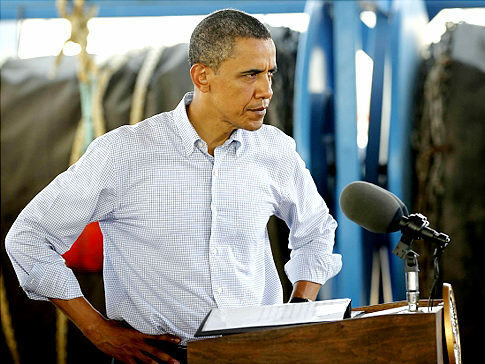 Obama has instituted a task force that will have the duty to help the Gulf Coast recover. Named the Gulf Coast Ecosystem Restoration Task Force, it will be made up of representatives from the United States federal government, state governments, and local officials who are located in the Gulf region. They will come from Alabama, Texas, Louisiana, Mississippi, and Florida as well. The goal of the task force is to come up with a successful recovery plan within a year and have it in full force rebuilding the regions affected by the oil spill of last spring. After the oil spill ravaged the area, the world was in shock and dismay at the unfortunate situation. After the leak was sealed and the disaster itself came to an end, so did much of the national attention. But President Obama realized that the aftermath would require a much more complex and longer fix. Despite the looming elections on November 2nd that are proving to be a potential turning point for the Obama era, the President realizes that his priorities lie with assuring the well-being of the American people before securing his party’s dominance in Congress.